In 2015 BigCityBeats will once again transform the Commerzbank Arena into the ‘biggest club in the world’. The clubbing Weekend of the Year will this time be bursting with BigCityBeats thrills and emotions for not two but three full days. On 5th, 6th and 7th June 2015 a gigantic ½-million-m² dance-floor complex will once again be assembled in the city of Frankfurt in the heart of Europe. 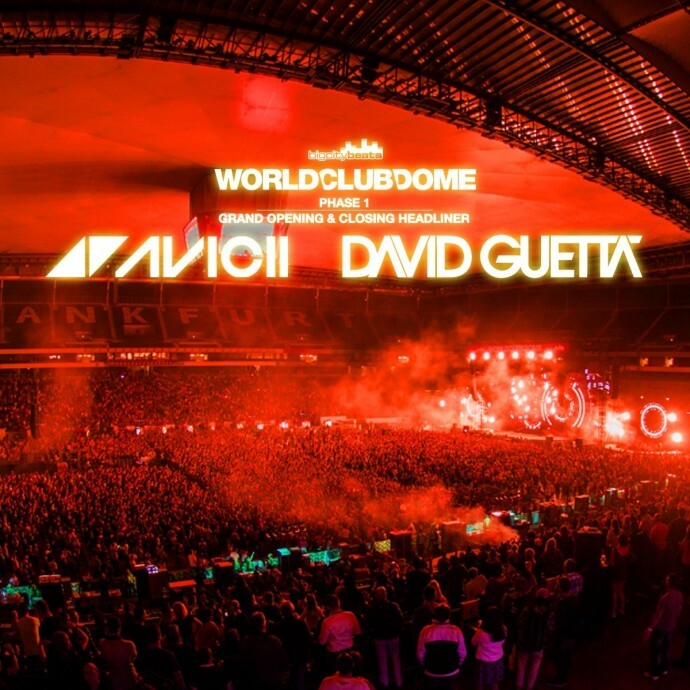 BigCityBeats is delighted to announce the first two sensational artists booked to play at the 2015 WORLD CLUB DOME festival as opening and closing acts. And whatever these two megastars have in store for the EDM fans, it’s bound to be unforgettable! In AVICII and DAVID GUETTA BigCityBeats have booked two of the finest DJs on the planet to respectively open and close the world’s biggest club. The 25-year-old Swedish superstar will deliver the official opening set of the BigCityBeats WORLD CLUB DOME 2015 on the Friday evening. And on the Sunday evening French DJ god David Guetta will play the official closing set of the BigCityBeats mammoth-event. Guetta, who released his highly anticipated sixth studio album, “Listen”, a few days ago, is storming up the charts, with current singles such as “Dangerous” and “Lovers on the Sun” dominating the international play lists. Lovers was No1 in Germany for a record-breaking 7 weeks this summer! Music and dance lovers planning to attend the BigCityBeats WORLD CLUB DOME festival can expect an energetic closing set featuring many of his hits. Avicii, too, is at the top of the international radio hit list, with new tracks like “The Days” and “Divine Sorrow (feat. Wyclef Jean)” continuing the success the Swede enjoyed with his No.1 album “True”. His mass popularity goes back to the SommerTagTraum of 2012. Now it’s time for him to return to BigCityBeats!